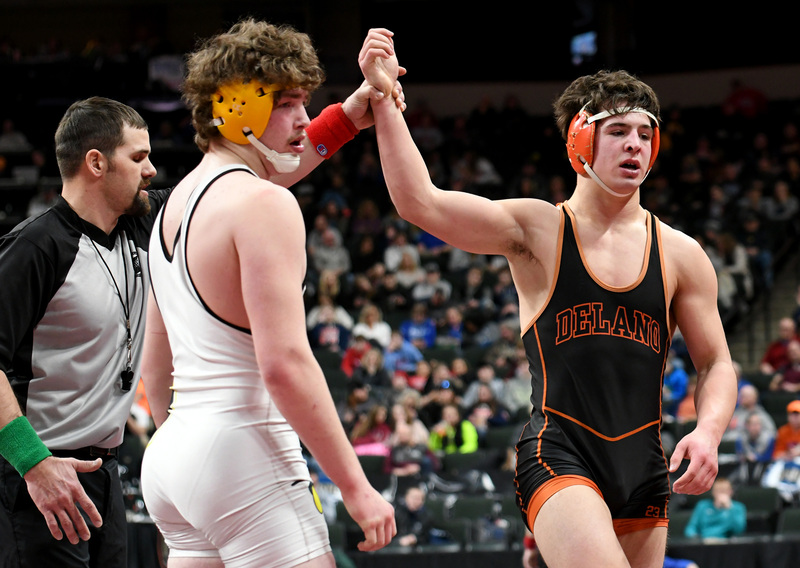 ST. PAUL – Three of Delano’s four state wrestlers put themselves in the Class AA semifinals of their respective brackets with wins in the quarterfinals Thursday night at the Xcel Energy Center. Delano’s Edward Hajas has his hand raised after winning a 5-3 sudden victory over Perham’s Dawson Kellogg in the quarterfinals of the Class AA State Wrestling Tournament Friday night at the Xcel Energy Center. Carson Tschudi (36-4) edged Thief River Falls’ Cade Lundeen by a 4-3 decision at 132 pounds. Tschudi faces Simley’s Ryan Sokol (49-0) in the semifinals Saturday morning. Sokol won each of his first two matches by technical falls. Moments before Tschudi finished his match on mat-5, Delano senior Tanner Kroells (33-2) finished off Thief River Falls’ Jake Davis via a 13-2 major decision next door on mat-1. Kroells squares up again Kasson-Mantorville’s Carlos Ruffo (20-5) in the semifinals. Delano’s final wrestler of the quarterfinals, Edward Hajas (32-4), used overtime to pick up a 5-3 sudden victory over Perham’s Dawson Kellogg. Hajas faces conference foe Danny Striggow of Orono (48-2) in the semifinals. Delano’s fourth state wrestler, senior Reier Sjomeling (23-7), battled his already-injured right shoulder in his quarterfinal match against Fairmont/Martin County West’s Jaxson Rohman. The health of that shoulder was compromised by Rohman on a shot in the opening seconds of the match. After an injury timeout, Sjomeling finished the match, but could do little against the stronger Rohman with one arm. Rohman took the match by a 21-8 major decision. Rohman moves on to face Big Lake’s Rocco Visci in the semifinals. Sjomeling (24-7) won a 13-2 major decision over Totini-Grace’s Michael Loger in the first round of wrestlebacks. Finishes and times for Delano/Watertown-Mayer swimmers Friday in preliminary round of the Class A state meet. Top 8 finishes (400 freestyle relay team) advance to finals. Finishes 9-16 advance to consolation finals. Those races are Saturday, beginning at noon. 200 MEDLEY RELAY: 13th – DWM (Black, Nuytten, Coyle, Borland), 1:44.13. 120 pounds: Reier Sjomeling 3-2 decision over Litchfield’s Eddie Simps. Next for Sjomeling: Fairmont/Martin County West’ (FMCW) Jaxson Rohman. 132 pounds: Carson Tschudi pin fall of Totino-Grace’s Bryce Erkenbrack at 1:11. Next for Tschudi: Thief River Falls’ Cade Lundeen. 145 pounds: Tanner Kroells 10-1 major decision over Totino-Grace’s William Jaeger. Next for Kroells: Thief River Falls’ Jake Davis. 220 pounds: Edward Hajas pin fall of PCHF’s Justin Matson at 3:51. Next for Hajas: Perham’s Dawson Kellogg. The quarterfinals and wrestlebacks for all classes begin at 4 p.m. Friday. MAPLE PLAIN, MN – Six individuals in Maple Plain reported to West Hennepin Public Safety Department that their vehicles had been rummaged through Jan. 24. At 3:59 a.m., a resident in the 1700 block of Howard Lake reported finding a dome light on inside his wife’s vehicle and footprints in the snow in his yard. An officer checked the area on foot and by patrol squad car, and did not locate anyone. It was unknown if anything was taken from the vehicle. Three other residents on Howard Avenue also reported that someone had gone through their vehicles. In one case, at a residence in the 1600 block, nothing was missing, but a hat not owned by the vehicle owner was found next to the vehicle and was given to police. That hat belonged to an individual whose vehicle was rummaged through in the 1700 block. Ray-Ban sunglasses and a camouflage hat were stolen from that vehicle. There was nothing missing from another vehicle that had been gone through in the 1600 block. At 8:04 a.m., a resident in the 4900 block of Drake Street reported her son’s vehicle was rummaged through and a wallet, cash, a debit card, and gift card were stolen. Neighborhood children found her son’s wallet a block away and had returned it to him, but the cash and cards were no longer in the wallet. In the 5200 block of Bryantwood Drive, a resident reported the trunk and console on her husband’s locked truck had been gone through and an extra key was stolen, as well as miscellaneous change. Anyone with information regarding these incidents should contact WHPSD at 763-479-0500. 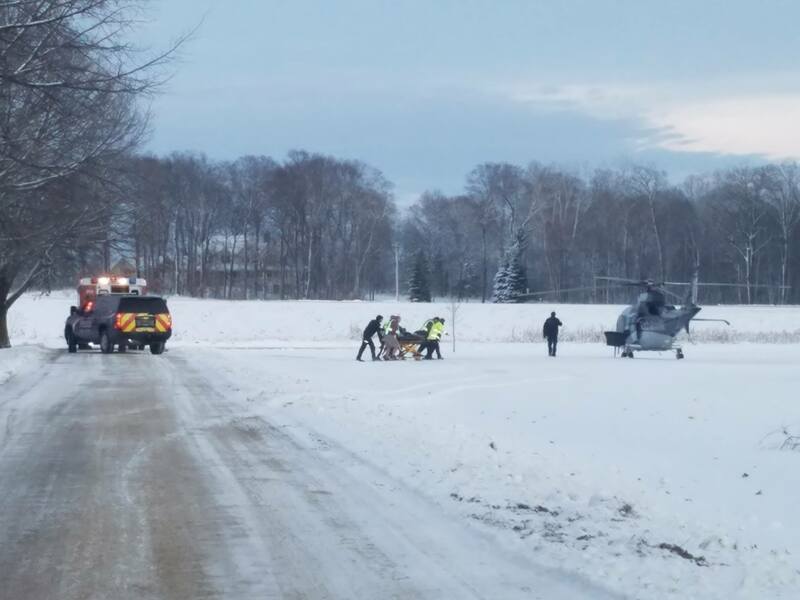 INDEPENDENCE, MN — A 61-year-old Plymouth woman was life flighted to North Memorial Medical Center after being kicked in the head by a horse. According to the West Hennepin Public Safety Department, the incident occurred at 3:50 Sunday at a horse stable in the 3000 block of Lake Sarah Road in independence. A woman had been kicked in the head and was unconscious for about five minutes. Due to unknown internal injuries and a previous medical condition that requires medication, North Memorial Air Care was requested for rapid transport to the hospital. The patient was stable at the time of the transport. No other information about the patient is available at this time. In a statement, WHPSD thanked North Memorial and the Delano Fire Department for their response to the situation. MONTROSE, MN – A Montrose woman and two young passengers, as well as a Buffalo woman, were injured in a crash Wednesday afternoon. According to the Minnesota State Patrol, a 2018 Dodge Journey driven by Amy Jo McDonald, 40, of Montrose, was northbound on Highway 25 when a southbound 2010 Ford Fusion driven by Jean Gardner, 77, of Buffalo, pulled out in front of it in an attempt to turn left onto Catlin Avenue. Gardner and McDonald were transported to Buffalo Hospital with noncritical injuries, as were McDonald’s passengers, a 7-year-old boy and 9-year-old female. All individuals were wearing seat belts and alcohol was not a factor in the crash that occurred shortly after 3 p.m.